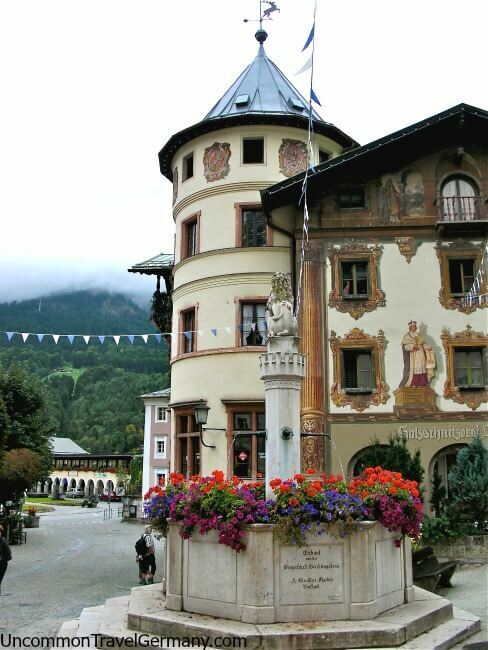 Berchtesgaden hotels are well-prepared for the 2 million guests they receive every year. There's a large supply of accommodations in the town and surrounding areas, and a wide range of prices and styles. The summers can be very crowded, but you probably don't need a reservation unless you want to stay in a specific hotel, or close in to the center. The Berchtesgaden area has been a hot-spot for tourism since the Middle Ages when pilgrims made their way to the local churches. If you don't have reservations, you can go to the Tourist Information Office in the big yellow building across the street from the Hauptbahnhof. They speak English and can find something for you that matches your requirements. 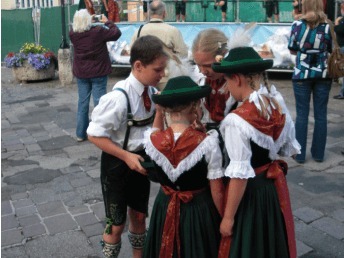 They'll make the phone call for you and give you a map of Berchtesgaden. This is a good place to pick up brochures about attractions, tours and day trips. You can get copies of bus schedules there, as well. Buses leave from in front of the train station and from the town on the main road (Franziskanerplatz, which becomes Maximillianstrasse), just off the pedestrian Markt. There are taxi stands in the same locations. 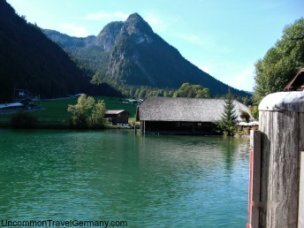 See my tips on getting around in the Berchtesgaden area. Practical tip: if you are arriving by train, you can walk up to the town, but the road is steep and it's a good ten minutes uphill with luggage. I did it once, but I wouldn't do it again! It's much easier to take a taxi from the train station, get to your hotel, ditch the luggage and then figure out the buses. Or you can take bus #839 from the train station; it takes you up to the town and runs along the main street with multiple stops. If you want to stay right in the old town there are a number of hotels and pensions to choose from. The three listed below have been popular with many visitors. (I've stayed at the Hotel Witteslbach and enjoyed it. See more info below). These Berchtesgaden hotels could be good choices if you want to spend time exploring the town, especially if you are without a car. The major sights in the area can be reached by bus from the town or train station. These three hotels are right in the center of the town, right in amongst the cafes and shops. They have English-speaking staff and great views from some of the rooms; ask for one of the view rooms. Hotel Wittelsbach. This is a friendly hotel with reasonably-priced rooms, some parking and great views. Has a traditional feel to it. Maximillianstrasse 16. For more info and booking, see Hotel Wittelsbach. 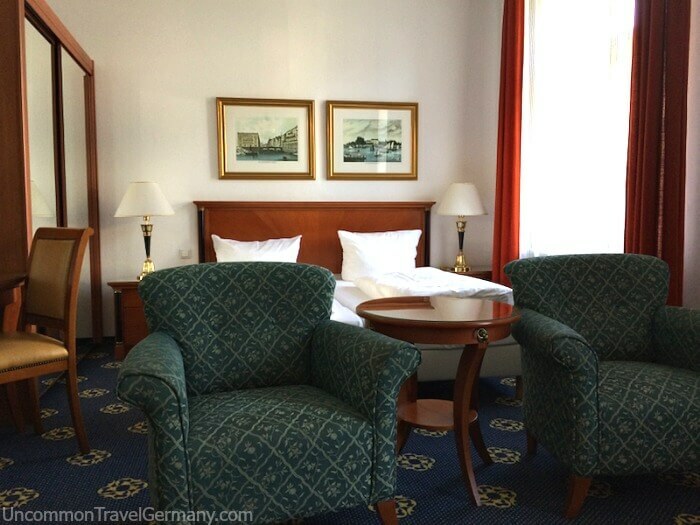 Hotel Edelweiss This 4-star hotel is a relative newcomer (2013) but has gotten super-high reviews. More expensive, and it tends to book up. There are three restaurants to choose from, plus a spa and indoor swimming pool. It even has free bike rentals and free babysitting. 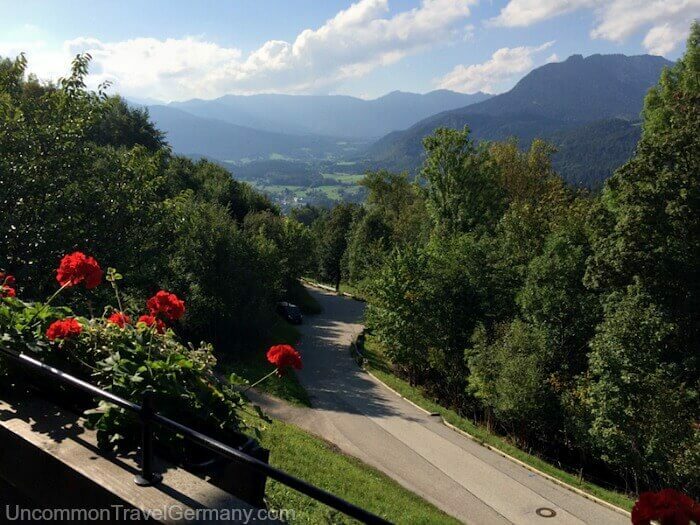 Balcony views of the Alps, and shuttle service from Salzburg. Maximillianstrasse 2. 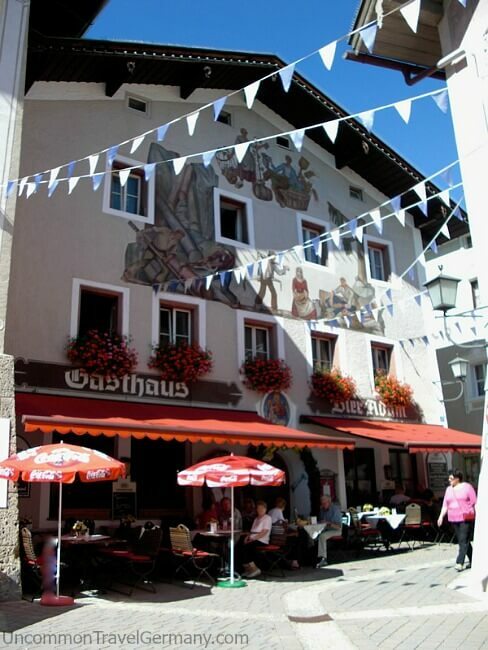 See Hotel Edelweiss for more info and booking. 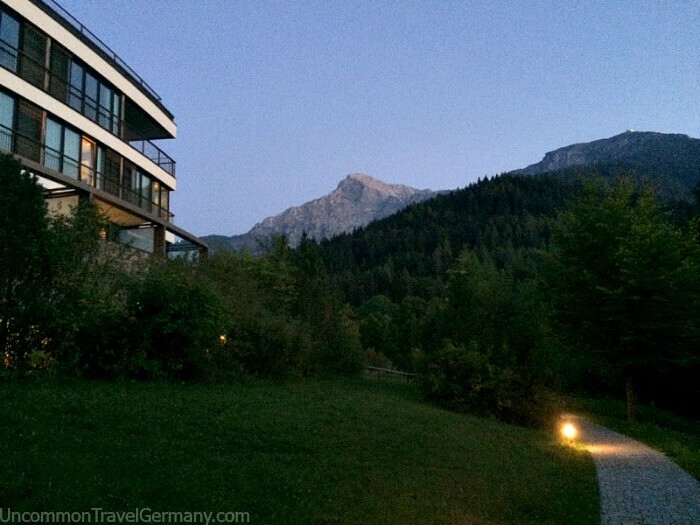 I like to stay at the Hotel zum Türken up on the mountain when I visit Berchtesgaden, but on my last visit, I also booked a couple of nights at the Hotel Wittelsbach to be in the town for a bit. I found the hotel very pleasant, with lots of old-time, German gemütlichkeit. The front desk staff were very friendly and helpful, and the room was comfortable. The window was right on the main street, so it was a bit noisy with the window open, but it quieted down at night. We had a great view of the mountains. The hotel is right in the heart of the town, and close to everything, which makes it easy to walk around and explore. Good to know. There's a laundromat right next door to the hotel; not easy to find in small German towns! The washers and dryers take Euro coins, and you can get soap pods at the hotel's front desk. Very convenient. The hotel will also give you bus passes for free rides on the local buses while you're staying there. For more info and booking, see Hotel Wittelsbach. For an inexpensive stay and more contact with a local family, you might consider a room in a small, family-run establishment or family home. For many of these, you would probably need to have a car, unless you were willing to take a lot of taxis. The Tourist Office across from the Bahnhof can suggest names and call for you, or if you're feeling adventurous and know a little German, you can use the handy notice board just outside the office. Dozens of photographs of local guesthouses are posted there, with the prices and an indicator telling you whether they have a vacancy. Each inn has a number and there is a phone that connects directly to the inn when you dial the assigned number. Pretty nifty system. Or look at the pictures, get the names, then have the office make the call. 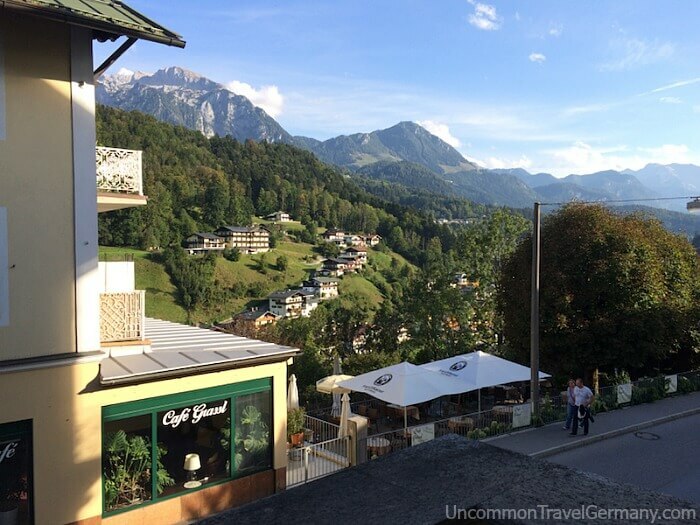 The community of Obersalzberg rises about 1200 feet above the town of Berchtesgaden. It's a ten minute drive up the mountain; buses and taxis are also available, although the last bus heading up there leaves the Bahnhof at 6:15 p.m. (5:15 p.m. on Fri and Sat). You can also catch a bus at one of the stops in town (#839) and change to #838 at the Bahnhof. Staying up there would be a real treat for anyone with an interest in the wartime history of Berchtesgaden. 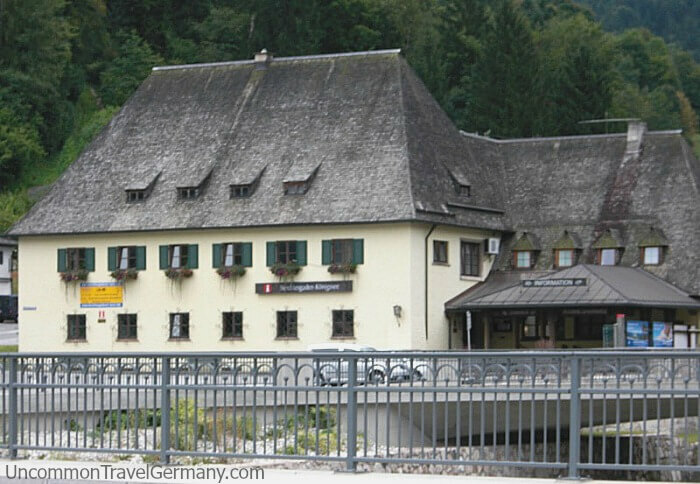 This was where Hitler had his home, the Berghof, along with some of his famous subordinates. The Documentation Center, an extensive museum about the Third Reich, is located there, as well as the departure point for buses to the Eagle's Nest. The former driveways to Hitler's Berghof branch off the road to the left, just below. 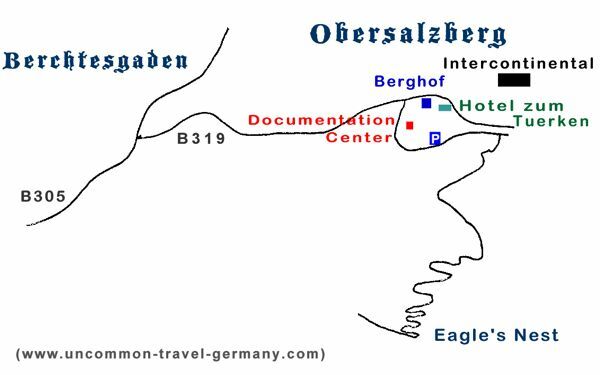 For more information about the mountain, see the Obersalzberg today, Obersalzberg history, and Hitler's Berghof. There are two hotels up on the mountain, complete opposites in personality: the historic Hotel zum Türken and the newish, luxury Kempinski Hotel Berchtesgaden. 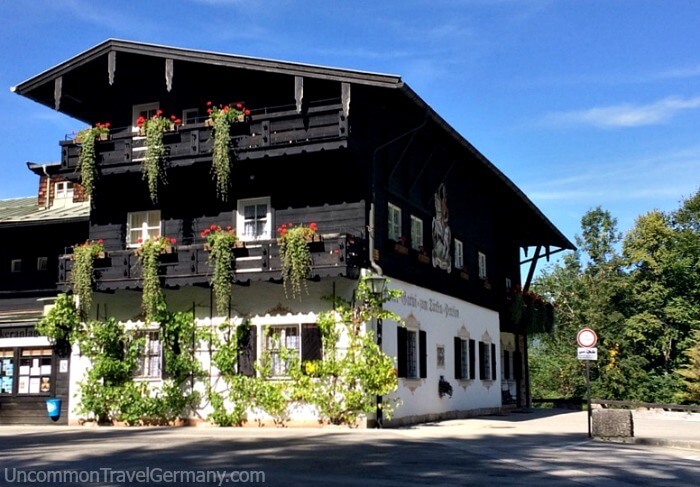 This charming old hotel survived the war and was a witness to much of the history of the Obersalzberg. Herr Hitler lived right next door; the ruined foundation of his house is merely a dozen yards from the Türken. 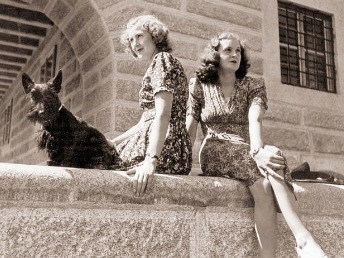 In 1933, the hotel was taken from its owners and used to house the SS guarding the Führer. The eerie bunker system under the hotel is open to the public. This traditional Alpine hotel is unique; the decor is 1940's and there are no phones, TV's or internet connections in the rooms. The hotel is owned by the family of the wartime owner and they provide a warm welcome and a delicious breakfast for the guests. They've added coin-operated washers and dryers for the guests...very nice! You can get change at the desk. Also, you'll receive a pass to use the buses for free while you're staying there. Most of the Berchtesgaden hotels will give you these. The views are spectacular and the rooms are comfy and old-fashioned. Be sure to get reservations if you want to stay here, and request one of the view rooms. I highly recommend this remarkable place - one of my most memorable experiences. For more information, history and photos, see the Hotel zum Türken. Or contact them directly for booking at hoteltuerkenobersalzberg@t-online.de. The Kempinski (formerly the Intercontinental) is a large, luxury resort sitting on it's own hill with great views of the mountains. This is a high-end, very modern hotel with first-rate rooms, four restaurants, a swimming pool, and a spa for its guests. There was a controversy over its construction; this was the same hill where Reichsmarschall Hermann Goering had his country home. All traces of his bombed-out house were removed and the shape of the hill was changed. Some felt it wasn't really appropriate to build a luxury hotel on that spot, but the Bavarian government is pursuing a policy of returning the Obersalzberg to its original character as an Alpine resort and seems determined to erase most of the traces of its wartime history. The hotel itself is very modern, but it's built with lots of stone and wood which gives it a warmer feel. Very pretty. The restaurant is elegant and has great food. I'd recommend a trip up there for dinner even if you're not staying there. I had some of the best carrot soup there that I've ever had. The grounds are nice to walk around at night, too. The Kempinski as the sun is setting. The Eagle's Nest is barely visible on the right mountain top. For more information and booking, see Kempinski Hotel Berchtesgaden. By Foot. 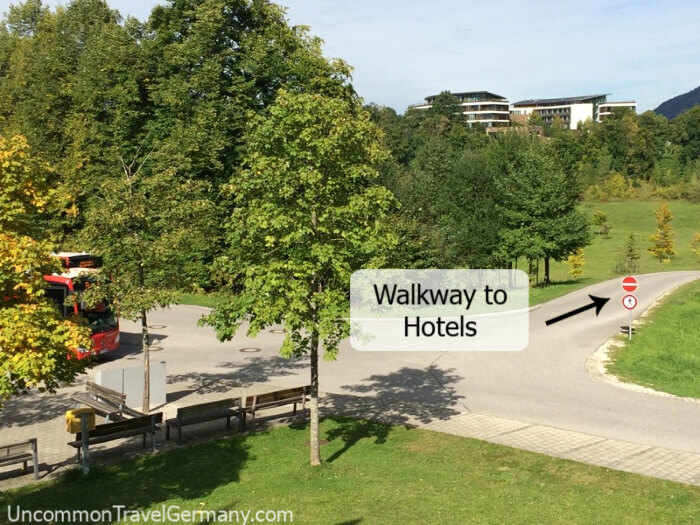 You can walk to both the Türken and Kempinski hotels from the Documentation Center area by following the road that circles the field just past the parking lot for the Eagle's Nest buses. You're sharing the road with the Eagle's Nest buses until you get past the field and join the road that goes past the Türken. It's about a fifteen minute walk to both hotels. Walkway to hotels leaves from parking lot for Eagle's Nest buses. By Bus. The bus that goes to the Documentation Center from the Berchtesgaden Hauptbahnhof, #838, also stops near the Kempinski Hotel (see map). It's the next stop after the Doc Center. It's also closer to the Hotel zum Türken. The bus stops are marked on the map below. 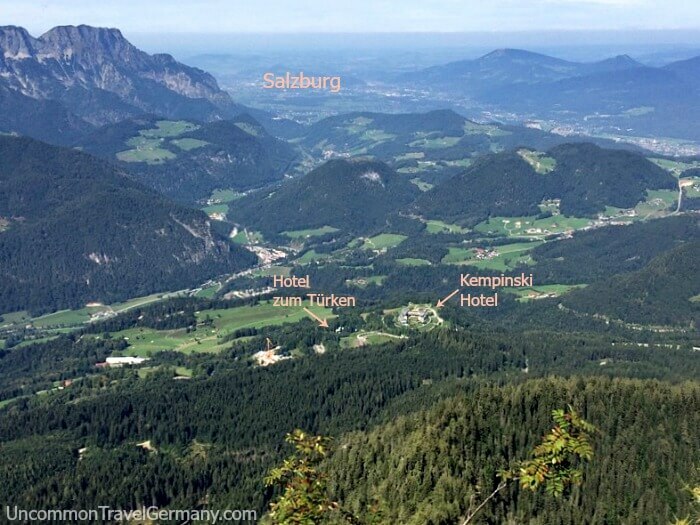 From the Eagle's Nest, you can look down on the Obersalzberg, and see all the way to Salzburg on a clear day.